Who would not be familiar with the name of Kinnaird College? It has got its impact since its inception. Top rated Girls College where every girl wishes to get admission. Some decades back LC and KC used to be rated as equal, infact LC had higher merit than KC, but with the passage of time and after being privatized it has got more status and merit much higher than that of LC. Now it has become a “status symbol” for people. With such a repute and remarkable standing it is not easy to get admission in KC and wish of so many remain unfulfilled, usually opting for sciences, and sadly I am one of them. You need to score really high in matriculation to get admission in KC, particularly for sciences. KC is also known for its wicked and bold environment, which lure so many of girls to get admission there. The activities and events at KC go with its standard. Being a KCite you will enjoy a large number of events, concerts and parties there. No one will deny the fact that most confident, brilliant and gutsy girls are found in KC, but at the same time it is also crowded with some notorious girls. You will also find a number of KCites with smug and arrogant attitude. Talking about its campus, well with a doubt KC has got very graceful building. It is wide, airy and very gorgeous. Its elegance is still there even after so many years. The architecture is amazing. Besides, wide and vast grounds also add to its beauty. Studies at Kinnaird College are up to the mark, both at intermediate level and graduate and post graduate level. Highly professional faculty, with all the required education and knowledge, well designed programs and facilities provided for studies have major contribution in making it an A rated college. In market, KCites have got place for them. Most of the KCites get admission in top medical colleges, engineering universities and other universities of Pakistan and contribute towards their country. Kinnaird College is providing a range of honors programs which are having worth in market. Studies at this level are very strict and organized. Kinnaird College is delivering a unification of quality education and values since 95 years. KC started its intermediate classes in 1913 and B.A in 1917. In 1939 they moved from Lake Road to the current campus of 20 acres. Today Kinnaird ranks as the country’s premier institution for education where over 3,300 students are enrolled at present. 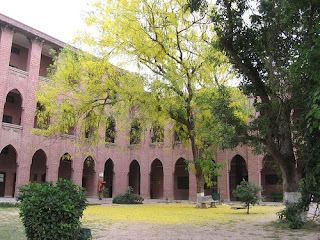 Kinnaird College has started programs leading to a Masters Degree in English Literature, Applied Linguistics, Mass Communications, French, English Language Teaching, Environmental Sciences, Science Education, Statistics and Computer Sciences. M.S in Accounting and Finance and M. Phil in English Literature is started last year. Various other programs will be started this fall. On talking to some Kinnaird College girls I was told that they have got a large number of wide, airy and neat class rooms, and some small as well. Out of which some are air conditioned. There are different large blocks, architecture is awesome and there is a lot of greenery. Facilities are more for BCS and Masters Students. One more complaint was of less no. of labs. Cafe is quite large having variety, but food is not so hygienic and very expensive. Some teachers are good some are average or even below like every institute. Level and quality of education is very high, systematic and organized. There is strictness in college. Well I guess students at KC are quite satisfied with studies there, which is remarkable. Having the repute of Premier College, KC is facilitating its students. Computer Labs, library and laboratories are there to facilitate students in their studies. Besides, grounds, sports equipments, auditoriums for games and different events to bring out talent of students. A large number of classrooms, different blocks, cafeteria and transport facility all over the city, to make the students more comfortable and productive. Hostel facility is also provided to the over board students. Kinnaird College has got its worth and place in market at every level. Students who do their inter get admissions in medical colleges and premiere universities and after that in professional institutes. Similarly graduates and masters of KC also get their place in market. KC have its very comprehensive and active website check it out by clicking here. email us so we can have your adress. after you email us at leetbv@gmail.com we shall reply with the proposal via mail!